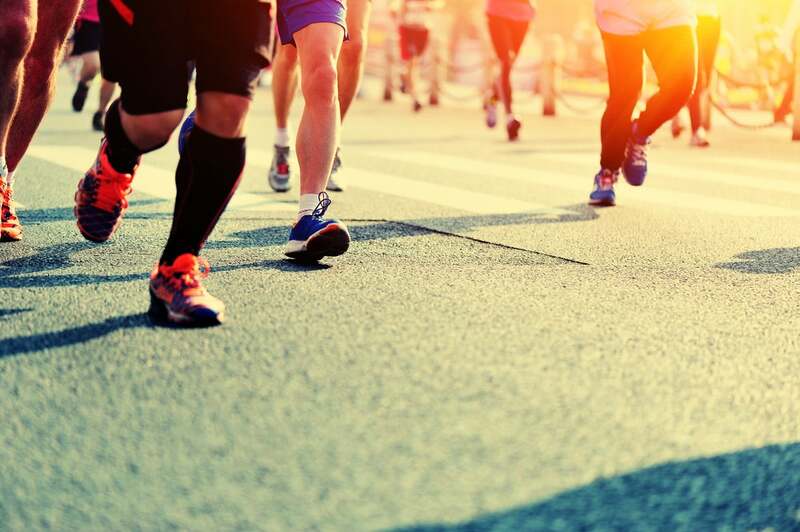 How much running experience do you need before you run a marathon? One year? Five years? Try a mere 24 weeks! As long as you are currently healthy, you can go from being a non-runner to a marathon finisher in less than six months. But it’s wise to do so in steps. Instead of going straight from zero to a 26.2-mile start line, we suggest you “climb the ladder” of standard road-race distances. Start with a 5K, move to a 10K, advance to a half marathon—and finally make the leap to the marathon. A step-ladder approach will prevent you from taking on too much too soon and keep you motivated throughout. The following four-part training plan will guide you along your journey. You’re ready to start when you can comfortably walk/jog for 20 minutes. If you’ve already completed a 5K, you can start with the 5K to 10K plan (likewise with other distances). All four plans involve a three-zone intensity scheme. “Easy” is a slow jog that allows you to speak full sentences without losing your breath. “Moderate” is a pace at which you feel in control of your breathing, but if you went any faster you’d begin to strain. “Hard” is relative, but it means running almost as fast as you can (90 percent of your max). This means you will run faster for 30-second hard efforts versus 3-minute ones, but you should complete both workouts feeling as though you could have given only 10 percent more. Most runners don’t pace themselves very well in marathons. A 2013 study by Spanish researchers found that among 40 recreational runners who completed a marathon, 18 slowed down by more than 15 percent between the beginning and the end and the remaining 22 runners slowed by an average of 40 seconds per mile. STEP 1: Use your half marathon time as a predictor. After you run a half marathon, enter your time into an online race-performance equivalence calculator such as this one. This will give you predicted times for races of other distances including the marathon. Note that these tools tend to predict marathon times that are a little too fast for beginners. STEP 2: Avoid slowing down in your long runs. Try to complete all of your long runs without slowing down at the end. If you are forced to slow down in one of these runs, start the next one at a slower pace. As your long runs get longer, the pace at which you run them will become more predictive of what you can do in a marathon. STEP 3: Do a marathon simulator run. 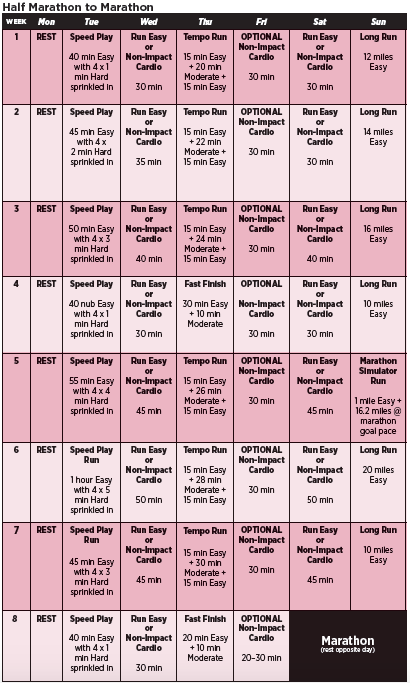 In week five of the Half Marathon to Marathon Plan, this workout is scheduled. It comprises an 1-mile warm-up, plus 16.2 miles (exactly 10 miles less than a marathon) at your estimated race pace. 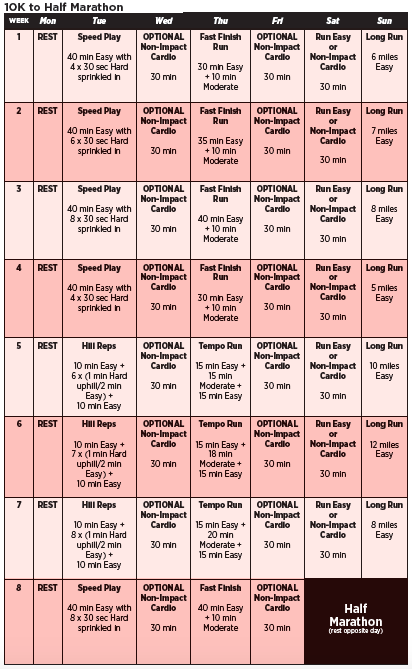 Complete this run at your current goal pace for your upcoming marathon, basing this goal on both Step 1 and Step 2. After you finish, use the result of the simulator to refine your objective. If you really struggle to sustain a goal pace of 10:45 per mile, for example, you might want to change your goal to 11:00 per mile. But if you still have a little left in the tank, leave your goal unchanged. In making such assessments, keep in mind that you will be three weeks fitter and also more rested when you run your marathon.